Featured in the February 1986 issue of Contrails. 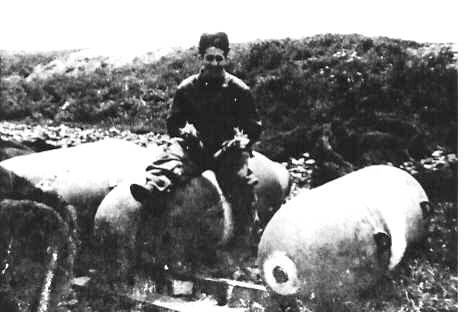 PFC Adolph Cello, 526th Squadron Ordannce Detachment, 379th BG(H), sitting on a 1,000lb bomb holding two tail fuses. Circa: 1943-45. A Bombardment Group airfield of the 8th Air Force was essentially a self-contained community. The servicemen who populated it represented a wide variety of Military Occupational Specialists other than fliers. All of them played a cooperative role in the successful operation and maintenance of a United States Army Air Force bomber base so the job of effectively bombing enemy targets could be accomplished. Adolph Cello served as a PFC in the 526th Squadron Ordnance detachment for most of the time the 379th was operational at Kimbolton. He tells what his work was like. He finished his service in a different role that will be revealed in his story. Enlisting in the service on November 4, 1942, I had six months of basic training including ordnance school at various camps. I was shipped out on the Aquitania May 9, 1943, destination unknown. After a number of days at sea the ship docked in the Firth of Clyde near Glasgow, Scotland. From there we boarded a train that took us to Kimbolton where we were assigned to Nissen huts. The following day some men pulled guard duty and others KP. A few days later our ordnance officer, Lt. H. B. McClanahan, assigned us to our duties. We went to the bomb storage area and lined up each bomb according to poundage. Completing this task, the bombs had to be camouflaged. Fuses were stored in a different area. The routine when it came time to load bombs aboard the B-17s went like this: We were awakened at an early hour in the morning. If some of the fellows had just gotten back from pass, you hear a bit of grumping. We got into our trucks and drove to the storage site to load bombs and fins on trailers. Two men were assigned to a plane. Rain made the site very muddy and the bitter cold made the bombs very difficult to handle. Fog made it somewhat rough since we had to drive slowly to stay on the roads. When we got to the runways we had to be careful that we didn't damage any planes. We had to use an energizer that was plugged into the belly of the plane since we weren't allowed to use the planes batteries. One of us went into the cockpit to open the bomb bay doors and snap the lights on in the bomb bay. We then shoved the bomb trailer under the bomb bay doors. Two armorer men were assigned to a B- 17 to set up the crank to lower the cable to the bomb trailer and a strap had to be placed under the bomb. The cable was hooked to the strap and the armorers had to crank the bomb to the top. 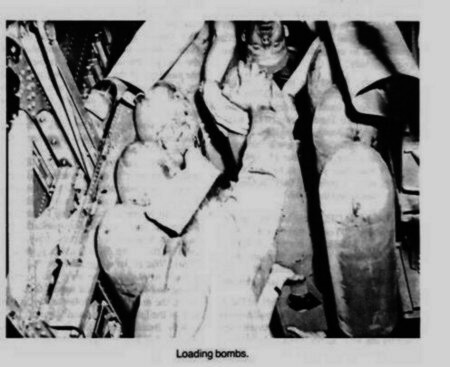 Ordnance men put the fins on the bombs that were hung on both sides of the bomb bay. After the planes were loaded the section chief, a Tech Sergeant, delivered fuses to each plane. The nose and tail fuse would be inserted and the arming wire was put through the fuses that was then placed with a safety pin. If the mission was scrubbed we returned to the planes and disarmed all fuses, removed the bombs and returned them to the storage site. By the time we got through it usually was daylight. We were so exhausted that some of us hit the sack instead of going to chow. Armorer men were the last ones off the plane. They had to make sure everything was in working order for the planes takeoff when a mission was "Go!" Came the day when rumors were going around that the 379th was going to be deactivated. We were going to get a furlough to go home and then go to Japan, so it was said. Responding to a roll call not too long after rumors about the Triangle K Groups future started to circulate, my name was called. The next day I was told to report to an infantry division in England. Upon arriving, the infantrymen were calling me a glamour boy because they saw an 8th Air Force patch on my sleeve and my usual haircut. That changed quickly: I got a crew cut, a change of uniform and combat boots. I went through two weeks of infantry training and then got a 24 hour pass. I returned to Kimbolton to visit the boys. When they saw me in my infantry uniform, combat boots and crew cut, they could hardly believe it. They arranged a party and the next day we said our good-byes. The day following the return to my infantry unit, the U.S. Navy took me and my "new" buddies across the English Channel and we landed somewhere in France. I went through five major battles and stopped at the Siegfried line. A few days later I was transferred to the 989th Anti-aircraft outfit. With two and one half years overseas and the war over, I was sent home under the point system. I landed in Boston and was discharged from Fort Dix, New Jersey on November 7, 1945.